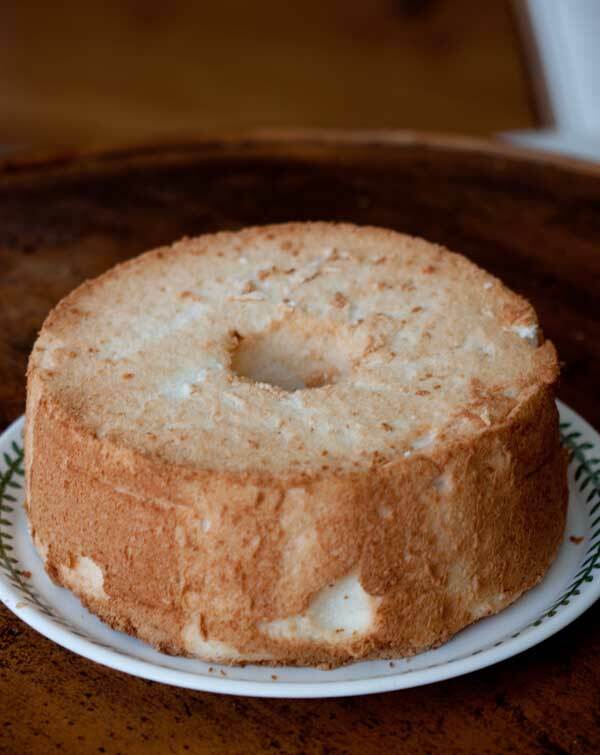 Basic Angel Food Cake. The lemon juice is not for flavor, but rather to keep the color of the cake a bright white. I believe the recipe is originally from Cook's Illustrated. Preheat oven 325 degrees. Have ready an ungreased angel food cake pan with legs. In a small bowl, whisk the already sifted flour with half (3/4 cup) of the sugar. Place remaining half of the sugar (3/4 cup) next to the mixer. In a clean mixing bowl using an electric mixer, beat egg whites at low speed until frothy. Add cream of tartar and salt and beat at medium speed until whites form billowy mounds. With the mixer still at medium speed, beat in the reserved 3/4 cup sugar, 1 tablespoon at a time, until all sugar is added and whites are shiny with soft peaks. Add vanilla, lemon juice and almond extract and beat until just blended. Sift the flour/sugar mixture over egg whites about 3 tablespoons at a time, and gently fold it in, using a large silicone scraper. Scrape batter into pan, smooth the top, and rap pan against the counter gently to release air bubbles. Bake for 50 to 55 minutes or until the top is golden brown and springs back. Invert cake so that it stands on its little legs and let the cake cool completely, 2 to 3 hours. To unmold, insert a knife between the crust and the side of the pan and loosen it. Slide cake out of pan and cut the same way around removable bottom to release. I like using C&H Baker's Sugar. It's basically a very, very, fine granulated sugar. Because it is so fine, it dissolves quicker in the egg whites. Still, you can make this with regular granulated sugar.